Sing, clap, and count your way among enchanting rainforest animals to the rhythm of the whimsical favorite, "Over in the Meadow." This rainforest is teeming with monkeys that hoot, ocelots that pounce, parrots that squawk, and boas that squeeze! It won't take much to have your child joyfully hooting and squawking too. 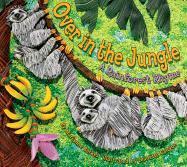 And the illustrations - all done in polymer clay - are truly remarkable, vividly conveying the abundant energy of a rainforest.